Plantacote® Pluss is a coated controlled release fertiliser which releases nutrients by a natural membrane process. Only high quality raw materials are used and a high level of quality control ensures that the release of nutrients results in a high level of crop safety and assurance for the grower. Plantacote® Pluss is well suited for application in ornamentals, tree nurseries and amenity areas. Release time is not affected by substrate type, pH, microorganisms or level of irrigation. 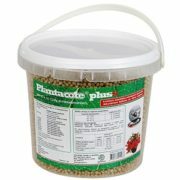 Plantacote® Pluss coated fertiliser starts releasing after 2-3 weeks, ensuring high crop safety. No risk of salt stress, even after storage of premixed growing media for up to 2-3 weeks. Release of nutrients from coated fertiliser is attuned to physiological crop requirements. Release of nitrogen is more pronounced during plant establishment and release of potassium is more pronounced during the later stages. Ultra safe coating: The tough elastic polymer coating reduces mechanical damage during mixing and ensures crop safety during periods of frost and hot weather.